Osteoarthritis (OA) is a chronic condition characterized by a gradual loss of cartilage from the joints. Common symptoms of OA include joint pain and stiffness, some loss of joint motion, and distorted joint shape. 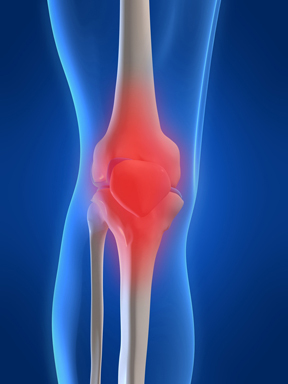 Osteoarthritis most often affects the hands, knees, hips, and spine. The joint pain associated with OA is aggravated with activity and relieved with rest. Morning stiffness is a common symptom of OA and usually resolves within 30 minutes of rising, although it may recur throughout the day during periods of inactivity. Advancing age is one of the strongest risk factors for OA. Women are two to three times more likely than men to develop OA. Obesity is strongly linked to the development of OA. Exercise and weight loss appears to lower this risk and may reduce joint pain in weight-bearing joints such as the hips and knees. Physical therapy and exercise improve flexibility and facilitate strengthening of muscles surrounding the joints. Well-cushioned shoes and orthotic shoe inserts may reduce stress on spine and leg joints while braces can provide external joint stabilization. Applying heat and cold to arthritic joints can alleviate joint pain and stiffness. Heating pads should be set on a timer and used for no more than 20 minutes at a time. The heating pad can be reapplied after 20 minutes of no use. Nonsteroidal Anti-Inflammatory Drugs (NSAIDs) relieve pain and reduce inflammation. Glucocorticoid (steroid) injections can also suppress inflammation and relieve arthritis symptoms when injected into arthritic joints. Glucocorticoid injections may be recommended for people who have OA confined to a few joints, or who have pain uncontrolled with NSAIDs. Joint injections may also be recommended for people with OA who cannot take NSAIDs. Joint injections are limited to three to four injections per joint per year so as to not cause further joint degradation. Surgery may be used to realign bones that have become misaligned to shift weight to healthier cartilage and relieve arthritis pain. It may also be used to permanently fuse two or more bones together at a severely damaged joint for which joint replacement surgery is not appropriate. Surgery is generally reserved for severe OA that significantly limits physical activities and does not respond to other treatments. If you or a loved one suffers from OA, make an appointment with your healthcare provider to discuss options for the treatment of osteoarthritis and the effects of arthritis on daily living. Dr. Chite joined Maryland Primary Care Physicians, LLC in 2011 and is certified by the American Board of Family Medicine. He received his medical degree from American University of the Caribbean, Saint Maarten, N.A. in 2005 and completed his residency program in Family Medicine at Creighton University Medical Center in 2011.